Brooklyn Digest: For Yankees, Are The Playoffs Still A Certainty? The Yankees' second half swoon continued over the weekend as they lost two of three over the weekend to the Toronto Blue Jays at The Stadium. This leaves the Yankees (91-58) on the brink of losing the American League East, as the magic number for the Boston Red Sox (103-47) is just two. Boston can clinch the division on Tuesday afternoon at Yankee Stadium, the first of a three-game series with the Yankees that doesn't nearly have the juice of their last visit here in late June. At that time, the Yankees were on pace to catch the 1998 team's record of 114 wins in the regular season, as they were 54-27 on July 1, in a virtual tie with Boston, who was 56-29 at the time. Since then, the Yankees have basically treaded water, as they are 37-31 since then, while Boston is 47-20 since then. This was not exactly how this season was supposed to go, as the thinking was the Yankees would make a run at that 1998 record and contend for the division title with Boston. Instead, the Yankees have coughed up a lot of winnable games against weaker opponents something Boston has not done. 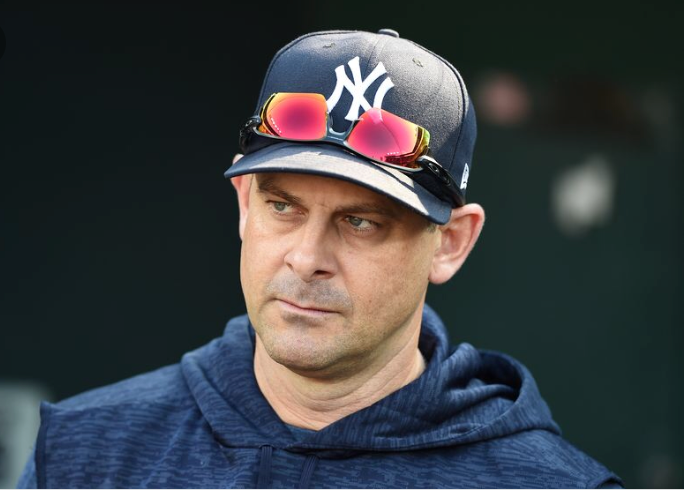 They have also been weighed down by injuries, such as to right fielder Aaron Judge, who missed seven weeks due to a wrist injury, and closer Aroldis Chapman, which has contributed to issues with their pitching staff from top to bottom. The Yankees are not only on the verge of losing the division, but they might lose home field in the Wild Card playoff, if not more. The Oakland Athletics (90-60) are just 1-1/2 games behind the Yankees, and they don't face any contenders the rest of the way. Oakland has a six-game homestand starting Tuesday night, with three against the Angels and Minnesota, followed by a six-game road trip, with three in Seattle against the Mariners, followed by three in Anaheim with the Angels. There is a real possibility that Oakland can win at least 10 of those and steal home field in the one-game Wild Card playoff from the Yankees, who have 10 of their final 13 against contenders. Oakland lost two of three over the weekend to the Tampa Bay Rays, who have surged into the playoff conversation. Tampa Bay, at 82-66, is the feel-good story of baseball, just 8-1/2 behind the Yankees with 14 games to play. Tampa Bay has three in Texas with the Rangers, followed by four in Toronto with the Blue Jays. They close out the season with a seven-game homestand, with four against the Yankees, followed by three with the Jays. The Yankees, who have lost 11 of their last 19, a relatively easy stretch with just three games against a contending team, Oakland, face a tough final 13 games. The Yankees have a six-game homestand with three against Boston, followed by three with Baltimore, who has proven to be a tough out, with six wins against the Yankees this season. The season ends with a seven-game road trip with four in Tampa Bay and three in Boston. Depending on how this week goes, that four in Tampa Bay could prove pivotal for the Yankees, as they have lost five out of six games there and would be a chance for the Rays to pick up major ground. There is a strong chance that Oakland, due to their easy schedule, can pass the Yankees and get home field in the Wild Card game, if not catch the Houston Astros (94-55, 4-1/2 game lead on oakland)for the AL West division title. When you add Tampa Bay into the equation, beware, because stranger things have happened. If the Yankees aren't careful, their hopes of being in the playoffs at all could be threatened. The weekend began with optimism as Judge was activated off the disabled list on Friday afternoon, just before they beat Toronto 11-0, as Masahiro Tanaka had another superb outing. On Saturday afternoon, that good feeling was extinguished as CC Sabathia had another rough outing, allowing 5 runs on 7 hits in 2-1/3 innings, staking the Jays out to a 5-0 lead. Toronto took an 8-1 lead when they touched up reliever Tommy Kahnle for three runs in the top of the seventh. The Yankees responded in the bottom half of the seventh when Giancarlo Stanton and Didi Gregorius had solo home runs, followed by a grand slam from Miguel Andujar that cut it to 8-7. That was Gregorius' second home run of the day, as he also hit a solo shot in the sixth. With the Jays' lead still 8-7, they stuck with reliever Tyler Clippard for the eighth. He struck out Stanton, then walked Aaron Hicks before getting Gregorius to hit a foul pop out to third base for the second out. Toronto then turned to Ken Giles to face Gary Sanchez, who hit a game-winning homer off Giles back in May in Houston when Giles was a member of the Astros. This time was different, as Sanchez flailed at three pitches to strike out to end the frame, and he looked like he was holding back a smirk as he walked back to the dugout. The Yankees proceeded to go meekly in the ninth against Giles, as Gleyber Torres flied out to center, followed by a Neil Walker groundout to second base, followed by a Luke Voit strikeout to end it. On Sunday, the Yankees got a nice outing from starter Lance Lynn, who allowed just 1 run on 3 hits and a walk, with 7 strikeouts, in 5 innings, and had a 2-1 lead into the late innings. After David Robertson pitched two solid innings, the Yankees turned to Dellin Betances, who has been serving as closer in the absence of Aroldis Chapman. Toronto scored two off Betances to take a 3-2 lead,, continuing a rough go of it for him, which has included a blown save in Seattle last Sunday, the start of this stretch in which the Yankees have lost five of seven games. The Yankees went quietly, as Aaron Hicks struck out with Stanton at third base in the eighth, followed by the ninth when Torres and Sanchez struck out with Gregorius on base after a single. The Sanchez strikeout to end it was similar to his at-bat against Giles Saturday, that he was just swinging at anything. The second strike was in the dirt, followed by a rising fastball at the letters, with Sanchez late on both of them. This was a brutal weekend for the Yankees, in the sense that it just highlights how much they have coughed up games against weak teams the last couple months. The pending return of Judge will give them a lift, but this team should have been deep enough to withstand his loss the last six weeks. The fact they have not been able to step up in Judge's absence will only put more pressure on him to perform when he is fully back into the lineup (he only played in the field in his return Friday night). It is remarkable to think that the Red Sox will clinch the division with just under two weeks left, something that was unthinkable when this season began, or certainly as soon as when they were last in New York on July 1 when the teams were in a statistical tie. With the division basically gone, the Yankees now have to dig deep and hold on to home field in the wild card game, and hope that they can go on a run like last October.